Kamui aka Saki Shibayama is a System Debugger working for CC Corp and the leader of the Cobalt Knights. In .Hack//AI Buster it is revealed she was once very klutzy and designed her avatar based on the previous leader she considered to be a mentor,Albireo who was unknowingly responsible for her strong desire to maintain order within The World. Which is the reason she has black hair and a gold and blue eye like Albireo,as well as a replica of his weapon the Spear of Wotan in the novels and manga. In AI Buster the Colbalt Knights deal with hunting down and deleting Vagrant AIs rather then dealing with players like the Crimson Knights.Kamui treats the slightest offense with equal importance of all other laws,going so far as to track one of her own suboordinates to discover they have been hiding a Vagrant AI from her just because she questioned iwhat they were doing. 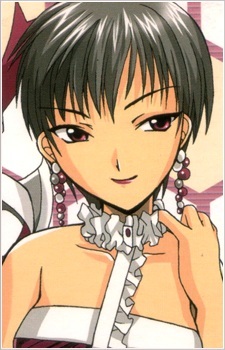 In the anime she is portrayed as someone who will delete anyone for the slightest law violation in public executions.